MILAN (Bloomberg) -- Ferrari is considering moving its fiscal residence outside Italy to save on corporate taxes as the supercar maker prepares for its spinoff from Fiat Chrysler Automobiles, people familiar with the matter said. The carmaker, which uses the colors of the Italian flag in its logo, may follow in the footsteps of Fiat Chrysler, which is registered in the Netherlands, listed on the New York Stock Exchange and based in London for tax reasons, said the people, who asked not to be identified because the discussions are private. 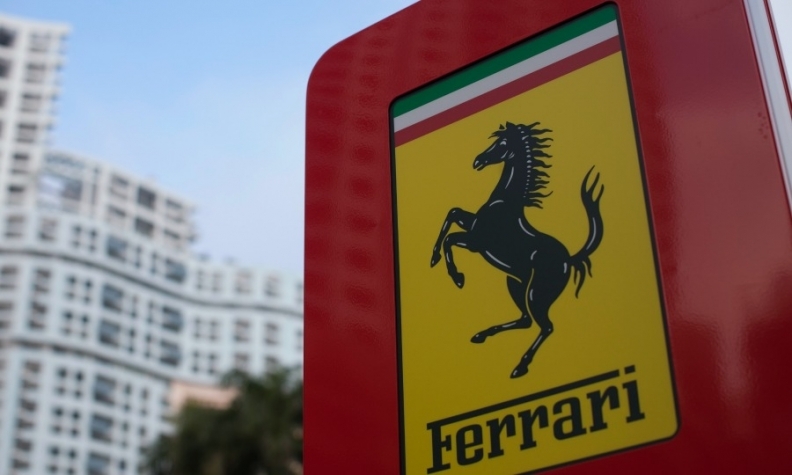 Other options including keeping its Italian residence are still on the table, and a shift in its fiscal residency wouldn't affect its manufacturing and engineering operations in Maranello, about 190km (118 miles) south of Milan, the people said. A final decision will be made in coming months, the people added. Ferrari shifting its corporate headquarters outside Italy would represent a symbolic blow for the country, which is struggling to end a cycle of recessions. Prime Minister Matteo Renzi is attempting to push through labor and tax reforms to make the Italian economy more competitive. Those efforts have already come too late for Fiat Chrysler and CNH Industrial, the truck and tractor maker spun off from Fiat in 2011. Both companies have already moved their headquarters to the UK from Italy. The move to spin off Ferrari is part of Fiat Chrysler's efforts to raise about $5 billion to cut debt. CEO Sergio Marchionne is meeting investors in the U.S. this week as Fiat Chrysler prepares to sell at least 87 million shares and a $2.5 billion mandatory convertible bond. The financing, which is backed by distributing 80 percent of Ferrari stock to Fiat Chrysler investors, will boost cash by $3.7 billion, Fiat said in a filing last week. Fiat Chrysler and CNH will benefit from the UK's corporate tax rate declining to 20 percent next year from 21 percent. Income from patents will eventually be as low as 10 percent, offering potential for additional relief. By comparison, Italy's corporate rate is 31.4 percent. The country is ranked 56th in the World Bank's Doing business ranking, just after Turkey and Hungary. The UK is 8th. Hampered by stifling policies, the Italian economy has stagnated over the past 14 years and contracted 10 of the last 11 quarters. Unemployment rates are near record levels, and thousands of Italians have left the country in search of a better future. Last year, the number of emigrants from Italy rose 19 percent to 126,000, according to statistics agency Istat. Fiat Chrysler plans to list 10 percent of Ferrari by the third quarter of next year. The carmaker will trade in the U.S. and possibly a European stock exchange, according to the company. Milan is being considered as the secondary listing, with New York the main market, the people said. London-based Fiat Chrysler hasn't commented on Ferrari's fiscal residence, but Marchionne, who is also Ferrari's chairman, insists the company's roots will remain tied to its traditional home regardless of financial decisions. Ferrari "is Italian as it has always been," Marchionne said last month at a Fiat event at a test track in Balocco, Italy. "Capital markets are capital markets."